PFA was fortunate enough to catch up with Carolyn Gatewood, a 2014 graduate of Kansas State Univer sity with a degree in Secondary Education with an emphasis in English and a minor in Leadership Studies with a nonprofit focus. 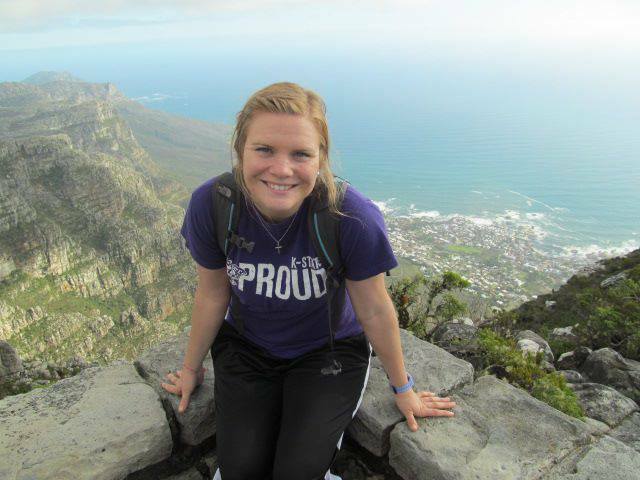 Through her involvement in organizations such as Student Foundation, K-State Proud, Blue Key, Association of Residence Halls, and Christian Challenge, Carolyn’s K-State experiences have proven essential in navigating the transition into her professional career. The Shawnee, Kansas native is now a 9th grade English/Language Arts teacher at the Ewing Marion Kauffman School in Kansas City, MO. My transition from college to career was a quick and challenging one. A couple weeks after graduation I went to Cleveland, MS for summer training for the Teach For America program. At the end of the summer, I moved to Baton Rouge, LA and began teaching high school English at a school in a rural area outside of the city. Any first year at a new job, especially the first one out of college, is going to be difficult, but the fact that I was experiencing a new culture and was 14 hours away from loved ones, magnified the challenges of my transition. To put it simply, everything felt hard. Everything felt challenging. On top of adjusting to a new job and people, I had to adapt to a new city, figure out how to manage an income, learn the best place to go grocery shopping, make new friends, etc… Some of it sounds silly, but when everything is new, everything feels overwhelming, including going grocery shopping. For the first 6-8 months it felt like I was constantly drinking through a firehose, while simultaneously trying to keep from drowning. Slowly, but surely it got better. I figured things out, grocery shopping felt less stressful, and I felt a stronger and wider capacity to do things independently and without crying (for real, cried to the auto mechanic because he was asking me so many questions about my car oil and I didn’t know how to answer him). Although it was one of the most challenging times in my life to date, I look back on that time with a lot of bittersweet emotions. While the experiences in transitioning to my career life were uncomfortable and stretching, they also taught me an extreme amount about myself, my strengths, and my abilities. Among other things, I relied heavily on the Career Center and my professors, mentors, and club sponsors to help me in preparation for my future career. I visited the Career Center a handful of times to take advantage of their resume help. By meeting with someone one-on-one, I was able to get the individualized help that I needed to make my resume marketable and competitive in my field. Additionally, I met with professors, mentors, and club sponsors throughout my time at K-State to discuss goals and visions for my career. They were able to provide me with critical insight and the space to process different thoughts and questions I had about teaching to create more clarity for what life after college was going to look like. What role, if any, did your parent(s) play in your collegiate years as well as your transition to career? While my parents helped me in a lot of ways, the most prevalent of all of them, was that they were present. They were there on move-in day at Moore Hall in August of 2009, and they continued to stay present attending different activities I was a part of, visiting me in Manhattan, and supporting me in my endeavors at K-State. Additionally, they financially supported me by paying for a portion of my tuition. This allowed me to take advantage of unique opportunities at K-State, and has allowed me more flexibility with my finances post-graduation. They continued to support me in my transition to my career. Even though I know it was difficult to have their youngest moving so far away from home, they were extremely helpful in moving me to Baton Rouge by driving a UHaul, with all of my belongings, all the way from Kansas to Louisiana. On top of helping me get settled in my new home, they came to visit me multiple times during my time in Louisiana, and were there to answer my multitude of questions about the responsibilities that come with being an adult in the real world. Even with the distance, their visits and the numerous phone calls we exchanged, helped to bridge the gap between my two worlds and not make home feel so far away. What advice do you have to current students as they finish their degrees and hope to start their careers in their given field? My advice would be to push yourself outside of your comfort zone, both at college and in what’s possible for your career. Now is the time to move somewhere unfamiliar, try something different, and have new experiences. By doing this, you allow yourself to not get stuck in what your career is supposed to look like. I went into college thinking that I wanted to teach elementary special education in my hometown, and left with a plan to teach high school English in a low-income, high-need area. It was the experiences at K-State, between different organizations and service trips, that shaped this new vision for me. Additionally, capitalize on the opportunities, resources, and people at K-State as you go throughout college and transition into your career. They are all second-to-none, so take advantage of them while they are at your fingertips. I’m going to cheat a little bit on this answer, and say that all of my experiences with the organizations I was involved in at K-State best prepared me for post-graduation life. My time in these organizations taught me interpersonal skills, how to work with others toward a common goal, ways to work with many different personality types, and the traits and strengths of a leader, among many other things. Although post-college brought many new experiences, the skills I gained while at K-State were transferrable to these new challenges I was faced with in my transition. I’m grateful for the people at K-State that made these experiences possible for me during college. Without them, I wouldn’t have been as prepared for post-college life. Thank you, Carolyn! We appreciate your time and input!